Dani Pedrosa believes Honda’s factory RC212V machine must find a more consistent level of performance to be regularly challenging for victories in MotoGP. The Spaniard claimed his eighth podium finish of the season in yesterday’s Estoril MotoGP, but he was powerless to run the impressive pace set by Yamaha rival Jorge Lorenzo and returning Ducati star Casey Stoner. The triple world champion made a typically fast start from the second row and led at the first corner before quickly surrendering first place to a hard-charging Lorenzo on the Fiat Yamaha. 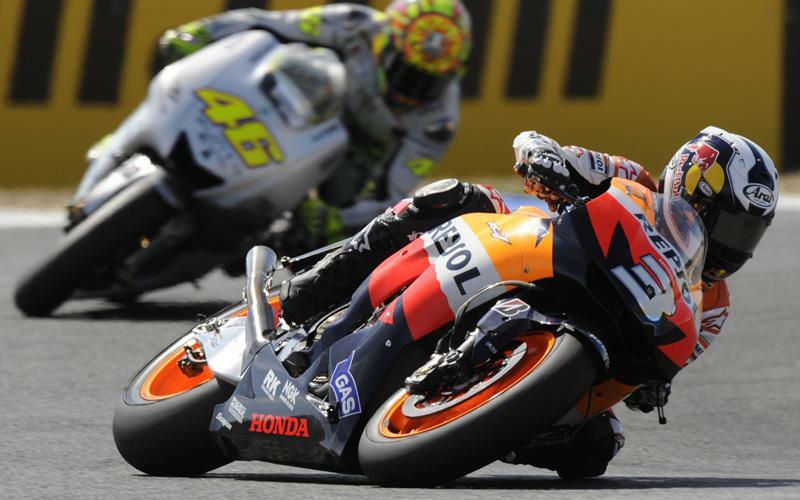 He managed to keep Stoner at bay until the third lap but once the Aussie had moved by, Pedrosa never threatened to retaliate. And afterwards the 24-year-old, who set a new lap record of 1.36.937, said: “Sometimes we are fast but at other tracks we struggle more to keep the pace and it is clear that we have some work to do. "We need to be more consistent and competitive at every track. In the race I made a very good start today and held the lead until the third corner where I ran a little wide and Jorge came by. "He was pushing really hard in the first few laps and even though I was too, I couldn’t match his rhythm as he opened up a gap. "When Casey came past I tried to stay with him and was able to put some pressure on and maintain a good pace. "I had a moment though where the bike was snaking as I braked, I ran wide and I nearly crashed - that cost me some time and opened up the gap to Casey. "So I’m reasonably happy with a podium and it definitely will now be an interesting fight for third place in the championship with Casey. "He is the reference in Australia and so the next race is going to be hard fought - I’m looking forward to it.